The exposition of 1900 in Paris took place at two connected areas. 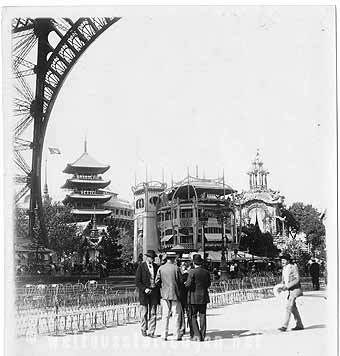 At the Marsfield with the tower of Eiffel and the hall of machines build for the exposition of 1889 and with the colonial exposition in front of the Trocadero build in 1878. Along the Seine with the "Rue des Nations" to the "Esplanade des Invalides" and over the "Pont D'Alexandre III." to "Grand Palais" and the "Petit Palais". ...-who counts all the nations, call the names, who comes together here so hospitable."